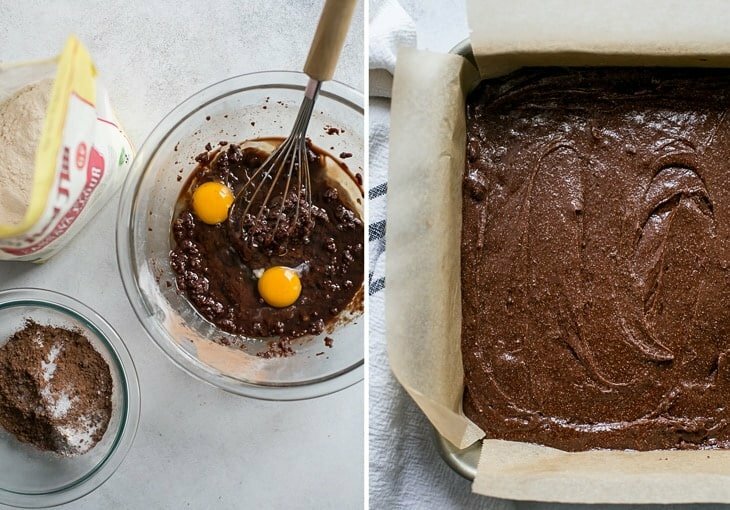 Your friends and family will have no idea these soft and delicious grain-free brownies are made with cassava flour. They’re gluten-free and paleo friendly! This post is sponsored in partnership with Bob’s Red Mill. 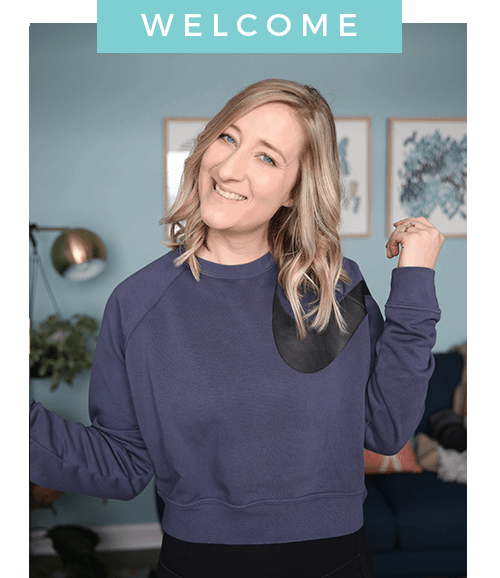 Thank you for supporting the brands I work with that help me bring you new recipes! As always, all opinions and thoughts expressed are my own. 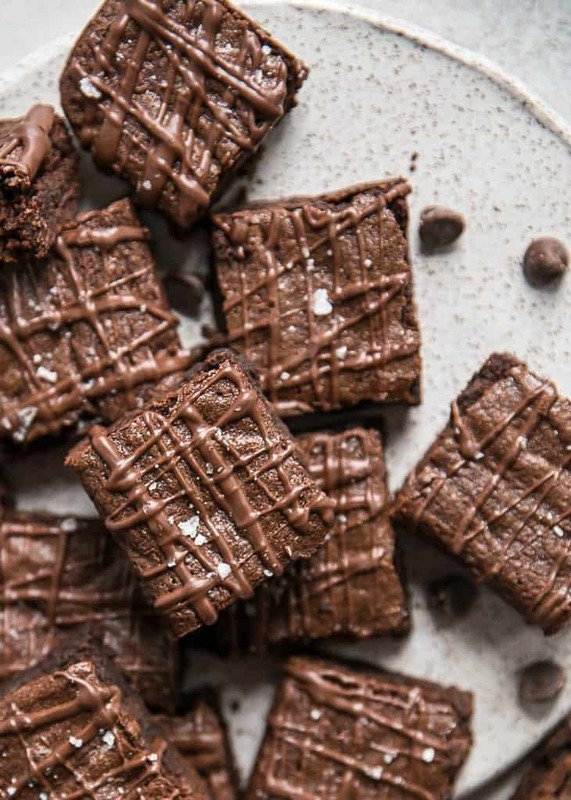 I want to call these “Casanova Brownies” because they’ll have you falling in love with every bite. Casanova – cassava… get it? Okay but SERIOUSLY. 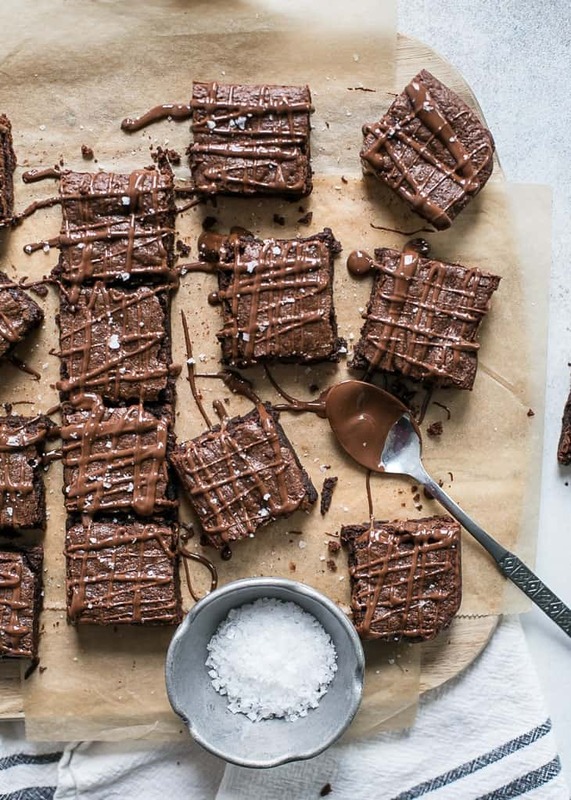 You won’t believe how delicious these brownies are. 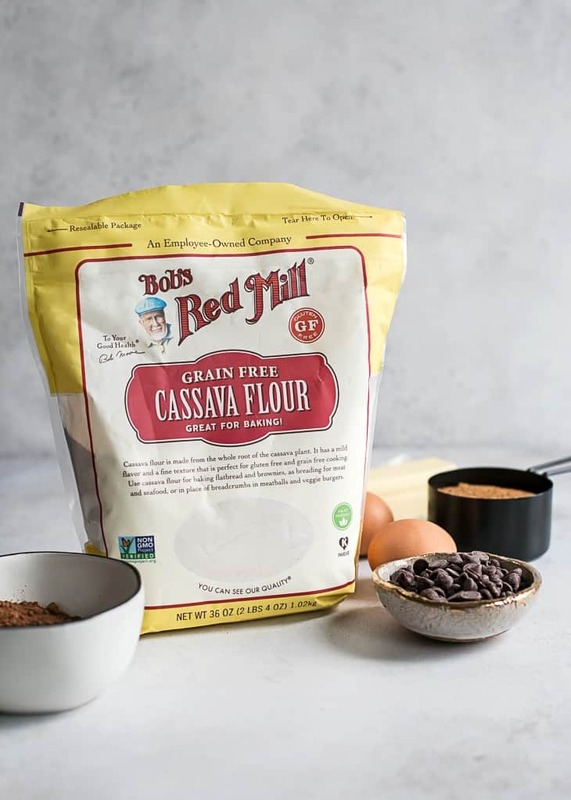 And they’re made with CASSAVA FLOUR – a new-to-me flour that I’m excited Bob’s Red Mill has added to their collection of products! You may know I am a huge Bob’s fan (who isn’t?) and I’m excited to continue our partnership this year using their high-quality products. Cassava flour is a gluten-free, grain-free and nut-free flour made from the whole root of the cassava plant. Bob’s Red Mill cassava flour has a mild flavor and fine texture that is perfect for gluten free cooking and baking, and it’s also non-GMO project verified. I wanted to test my hand at cassava flour and it’s been a while since I’ve shared some brownies with you so let’s do this! Note: Some say it’s a 1:1 conversion with wheat based flours but unless you’re an avid baker, I would use caution when subbing. This recipe was tested several times specifically using cassava flour. 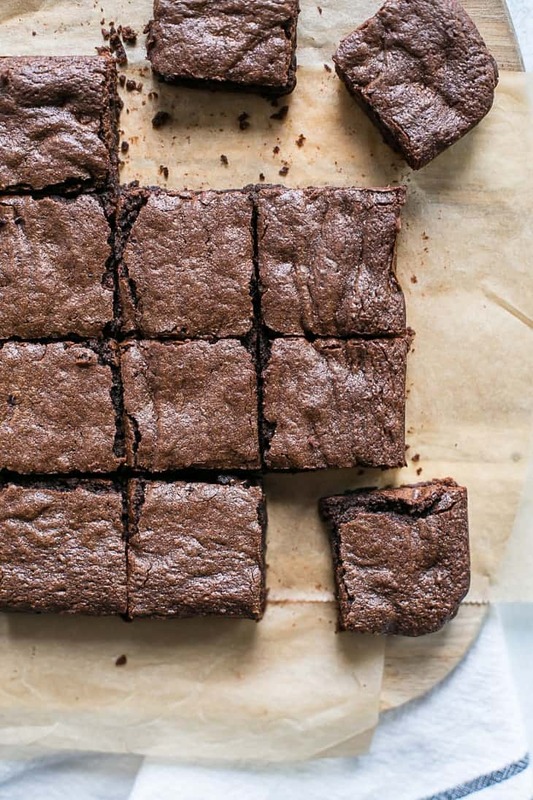 These brownies come together like a traditional, fudgy brownie recipe. First you melt down the chocolate with butter until smooth – you can do this via stovetop or microwave. If using the microwave I recommend using half power (my microwave is pretty strong) and time intervals of 30 seconds, whisking until smooth. Why melted chocolate? Because that’s where the fudge factor comes in. Next you’ll whisk the sugar into the slightly cooled chocolate–butter mixer. And add the eggs and vanilla. Next the dry ingredients – cassava flour, cocoa powder, salt and baking soda, mixed together separately – get added into the mixing bowl. The batter will be thick and fudgy-looking – almost a cross between frosting and batter. Then the brownies go into the oven! You’ll need about 18-20 minutes here, but everyone’s ovens are different. And it would be tragic to over-bake these so watch your baking time and brownies closely. I think my first batch was done at 21 minutes and my second batch I under-baked *just* slightly at 19 minutes. While baking time can help give you an idea as to whether or not your brownies are done, the best indicators are your nose, eyes and the toothpick test. An inserted toothpick coming out with crumbs – not completely wet batter but also not completely clean. The brownies will set upon cooling (about 45 minutes) and you’ll get a lovely fudgy bite when they’re baked just right. FLOUR: I have *not* tested these brownies with another flour. I also only used Bob’s Red Mill Cassava Flour so I can’t vouch for results from other cassava flours. I’ve heard different brands can produce different results. BUTTER: You can sub a dairy-free butter but I did not test these with coconut oil. SWEETENER: The granulated sweetener is needed her to keep the brownies from being bitter. It is not a good idea to sub with maple syrup or honey as the wet-to-dry ratio of ingredients will then be altered. I did not test with different sweeteners other than granulated and coconut sugar. But OH EM GEE, my friends… You really need these in your life. I opted for a little chocolate drizzle and sea salt dusting but honestly that’s just me being extra. These cassava brownies are totally delicious without the extra presentation. I may have been influenced by the Great British Baking Show. If you make this recipe, I’d love to hear from you! Leave a comment and review below the recipe letting me know what you think! It helps others find the recipe too. 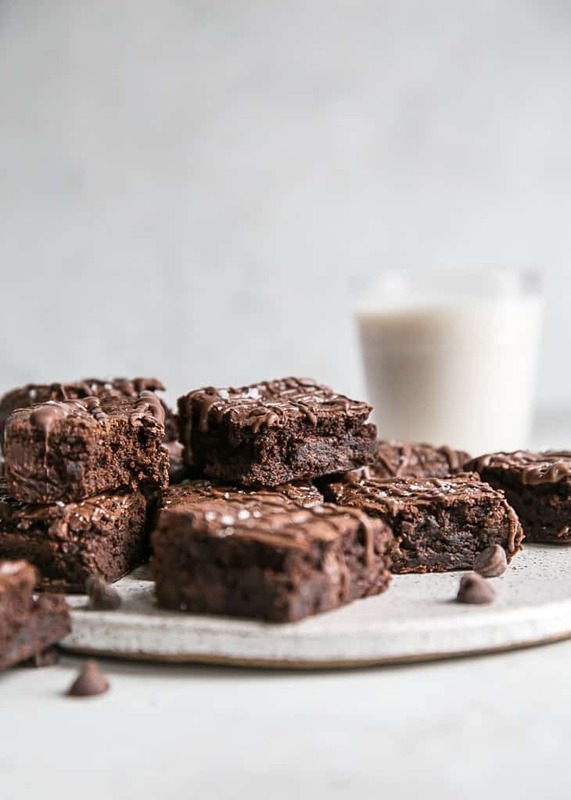 Delicious, soft and fudgy grain-free cassava flour brownies. 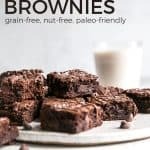 Whether you’re following a gluten-free diet, looking for a paleo dessert or just want a healthier baked good, you will love these! Preheat oven to 350ºF and line 8×8 baking pan with parchment paper; set aside. Combine dry ingredients: In a medium bowl combine cassava flour, unsweetened cocoa powder, salt and baking soda; set aside. Combine wet ingredients: Using medium saucepan over low heat melt together 2/3 cup chocolate chips with butter (or ghee), whisking until smooth. If using microwave, use large glass bowl and melt chocolate chips with butter on half power in 30 second intervals, whisking in between time until smooth. Allow mixture to cool slightly, then whisk in sugar until smooth, about 1 minute. Whisk in eggs and vanilla until combined. Transfer chocolate mixture to large bowl (if you used a saucepan) and add dry ingredients; mix using large silicone spatula or wooden spoon until combined. Batter will be thick and fudgy, almost frosting like. Transfer to prepared baking pan, making sure batter is evenly spread into all four corners. Bake on the counter gently to settle the batter if necessary. Bake brownies for 18-22 minutes. Watch baking time carefully at 18 minutes. Edges of brownies should rise slightly. Use inserted toothpick to check for wet batter. If toothpick comes out with very wet batter, brownies need another 2 minutes or so. If toothpick comes out with crumbs, brownies are done. I think it’s best to be more cautious with this recipe and bake them almost under-done. You don’t want the toothpick to come out clean – that means the brownies are over-done. Allow brownies to cool at room temperature in pan for about 45 minutes. You can also cool brownies in fridge. Lift parchment paper and set brownies on cutting board; use large sharp knife to cut brownies into 16 squares. Tip: wipe knife clean with damp paper towel before each cut. ENJOY! If you’d like to add the chocolate drizzle, melt together 3 tablespoons of chocolate with 1/2 teaspoon coconut oil. Drizzle over cut brownies on parchment paper and dust with flaked sea salt. *I have not tested this recipe with other cassava flours. I’ve heard sometimes they can produce different results depending on the recipe. I can only recommend Bob’s Red Mill here. **I have not teste this recipe with coconut oil but it may work. A dairy-free butter like Earth Balance should work though. Nutrition information provided approximate with ingredients listed. These brownies look SO fudgey Ashely! I still haven’t tried baking with Cassava flour I’ll need to give it a try! Can’t wait to try!! How many calories per serving? Just updated the recipe card! Somehow missed adding that in – approximately 161 calories. Thank you for your comment! Yum!! I’m assuming the answer is no, since granulated sugar works differently than liquid sweetener, but do you think maple syrup could be used instead? Maybe in a different quantity…? Hi Franny – you probably could use maple syrup. If I were testing this myself I would probably use just 1/4 cup or 1/3 cup at the most, and then add another tablespoon of cocoa powder as well as maybe 2-3 more tablespoons of cassava flour. Hope that helps! 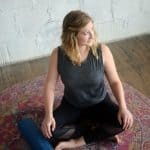 Would love to hear back if you try. I can just eat melted chocolate by the spoonful! Same with brownie batter. It’s actually quite dangerous, not gonna lie! These brownies actually look like gems. Have you tried this recipe with flax eggs? 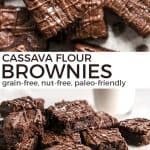 I hope I can find a great vegan brownie recipe with cassava flour! 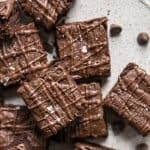 Would adding cacao nibs instead of dark chocolate chips? I’m afraid the cacao nibs won’t melt down and offer the same consistency as chocolate chips do. You’d be missing some of the sweetness needed as well. Did I read this right? Where do the last 1/3 cup of chocolate chips go? Sorry about that that! Mixes into the batter before baking. Will fix recipe directions. For he chocolate chips it’s 1 cup of chips. Google says that is equal to 150g 🙂 I weighed at 6 ounces. Hope that helps!